New Delhi: Indian sprint sensation Hima Das was on Wednesday appointed as UNICEF India's first-ever Youth Ambassador. She will work towards creating awareness among youths and help in development of children in India. Also, she will raise awareness about their rights and needs while trying to help amplify their voices as active participants in decision making, thus contributing to their holistic development. Hima's involvement will definitely help in increasing accessibility to her village which is called Kandhulimari, situated in Dhing, a small town approximately 20 kilometres from Nagaon district in Assam. 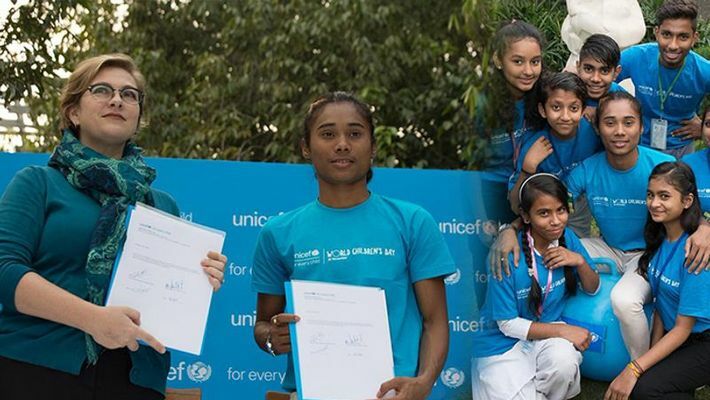 "I'm honoured to be chosen as @UNICEF India's Youth Ambassador, and I hope I will be able to inspire more children to follow their dreams," Hima said in a post on UNICEF India’s Twitter page. Hima won India's first ever gold medal in track events at the IAAF World Under-20 Athletics Championships in Finland when she recorded a time of 51.46 seconds in the 400m race, this July. She then bagged a gold and two silver at the Asian Games held in Jakarta this year. She currently holds the Indian national record of 51.00 secs which she clocked at the Asiad to qualify for the 400 metre final and clocked 50.79 seconds thereafter to bag silver. She went on to win another silver in the mixed 4x400m relay and bagged a gold in the women's 4x400m relay. Adidas recently signed Hima for an endorsement deal. The sportswear giant said in a statement that the athlete will now be equipped with the best products that Adidas has to offer for her racing and athletic needs. And UNICEF’s announcement now completes an incredible year for the 18-year-old who has earned the nickname of 'Dhing Express' after the name of her village.